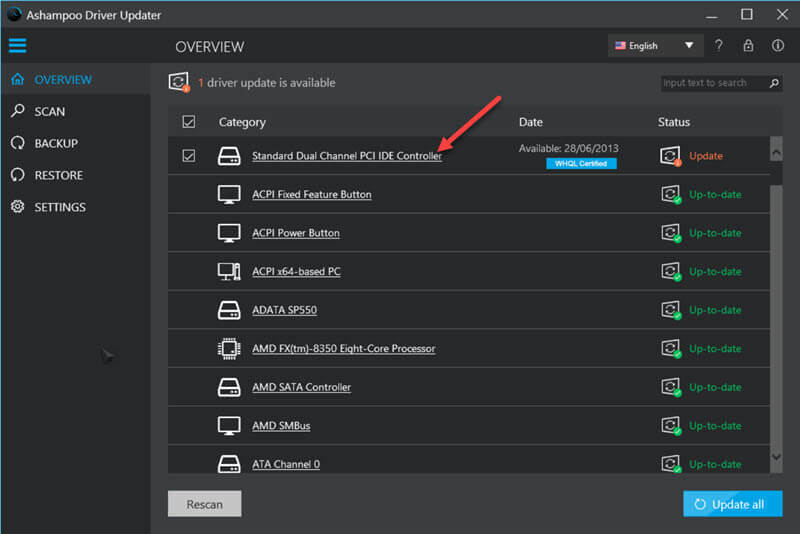 Ashampoo has kindly offered our Dave’s Computer Tips readers a chance to win a copy of their Driver Updater program. We have 10 licenses to give away in this contest. Each one is currently valued at $29.99 and they are good for one year from the time of installation and can be used on three PCs. At the time of this writing, there is a discount price of $19.00 being offered so you can save some cash on your purchase. Or, you can enter this giveaway contest and maybe win a free copy? This contest will be active beginning on April 3 and will end at midnight on April 25, 2019. Installation is fast and easy. There are no “gotchas” to worry about like extra possibly unwanted software. After the program is installed you will have a trial period in which you can try out its various features. Please note that not all features are made available in the Trial version. This software is simple to use. When you first fire it up, it will run a scan of your drivers against its 400,000+ driver database. 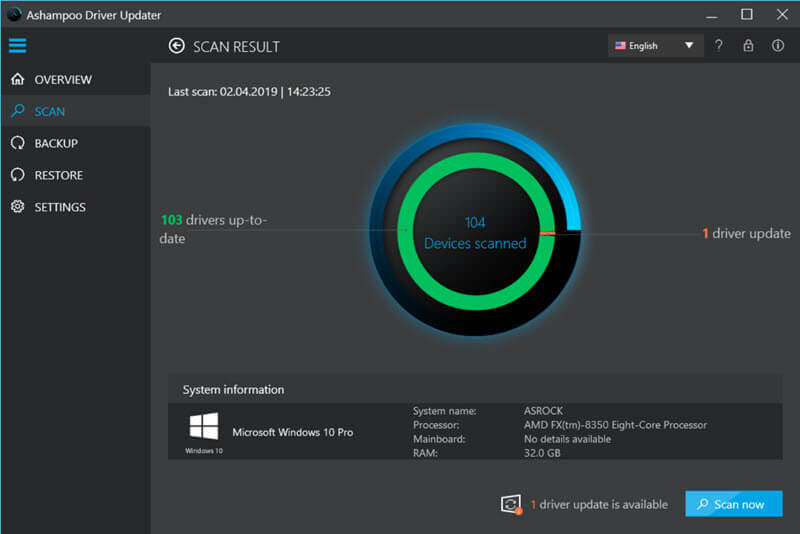 When it is finished, and it is a fast scan, you will be informed of the number of drivers on your computer system that are outdated. In my case, and for this article, it only found one. I keep my drivers up-to-date so your list might be much longer. 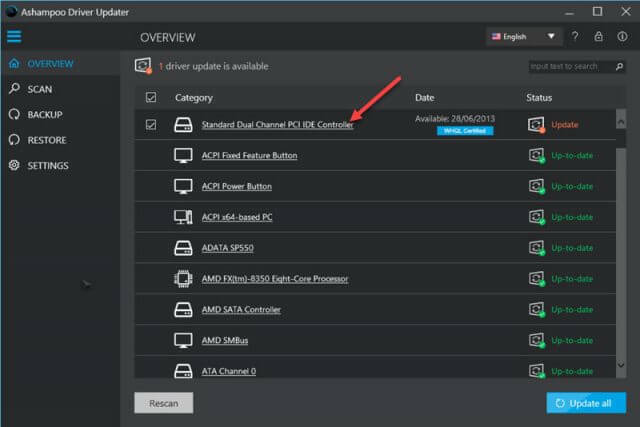 When you are ready, you can click the Update Driver button in this window to download and install this single driver, or you can go back to the previous window and update all the drivers you have selected. All these steps give me confidence in the program. 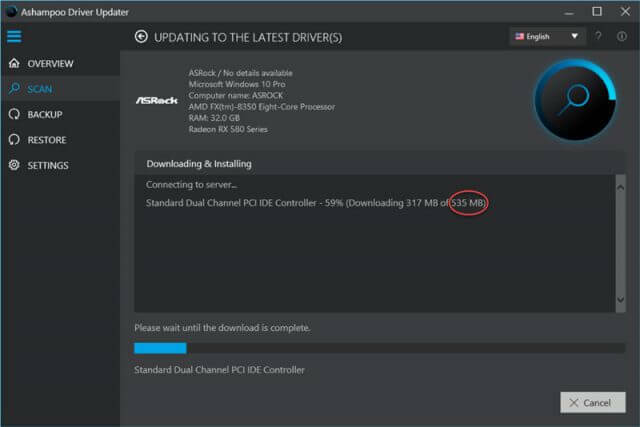 the reason I circled the file size in the above image is because I thought it was pretty big, but everything is working just fine after this driver installation. 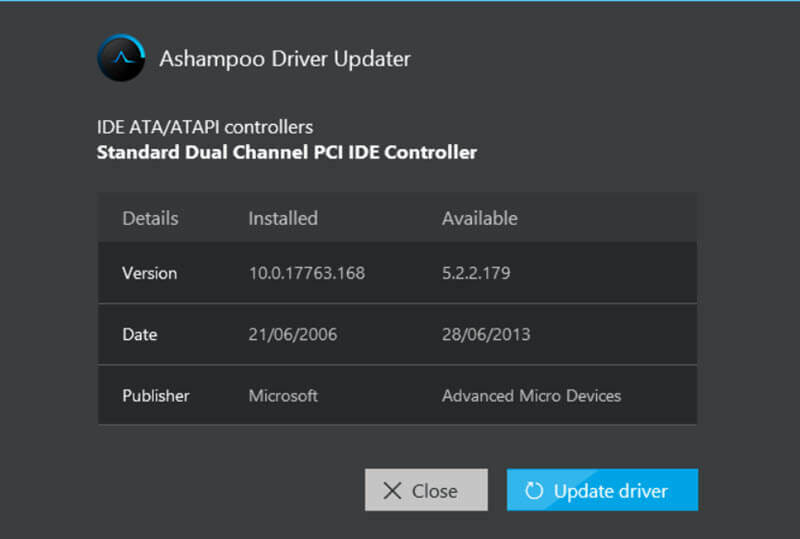 Speaking of big, I had Driver Updater back up all my drivers. The resulting files, all compressed in ZIP format mind you, came to a whopping 957MB. After this download, the Driver Updater downloads folder contained 561 MB. That makes a grand total of nearly 1.5 GB! The reason I bring this up is that the default Downloads and Backup folders created by Driver Updater are stored on your system drive. I immediately changed these folders to another drive in the Settings Menu. Whenever I begin working with a new program such as this, the Settings menu is usually the first place I go. You never know what is lurking in there. Note: This is one of the features that can’t be accessed in the Trial version of this program. Speaking of settings, one thing I don’t like is when a piece of software want to start with Windows. Driver Updater has this behavior set as the default and that checkbox was immediately unticked by yours truly. Drivers, as important as they are, do not need to be constantly monitored. I prefer to run a manual scan on a regular basis, but I see no need to run a program in the background when it is truly needed only once in a while. That’s just me– system resources are precious and I guard them carefully. I only have one complaint about this program and, again, it’s a personal preference. When I click the “X” in the upper-right corner of a window, I expect that program to shut down. Not Driver Updater– it informs you that it will continue to run in the background. Nooo! I already explained how I felt about that. In order to turn it off, I have to right-click its icon in the System Tray and click Exit. As you can see in the above images the interface is pleasing to the eye and easy to navigate. That one small grievance aside, this program worked flawlessly. It found an outdated driver, backed up the old, installed the new, and all without a hitch. Perfect! 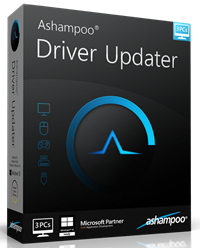 We’d appreciate it if you’d take a moment and submit a comment telling us why you’d like to win Ashampoo Driver Updater. However, submitting a comment is not required to enter this contest and will have no bearing on your chances. For your chance to win, simply enter your name and valid email address in the spaces provided below, then click Enter Contest. After your entry is accepted you will be presented with options to share the contest on Twitter and/or Facebook. For each person who enters the contest as a result of your share, you will earn two (2) extra entries! Sharing the contest on social media is completely voluntary, but is encouraged. Winner(s) names will be posted on this giveaway page. Please check back here to see the winner(s) name announcement! 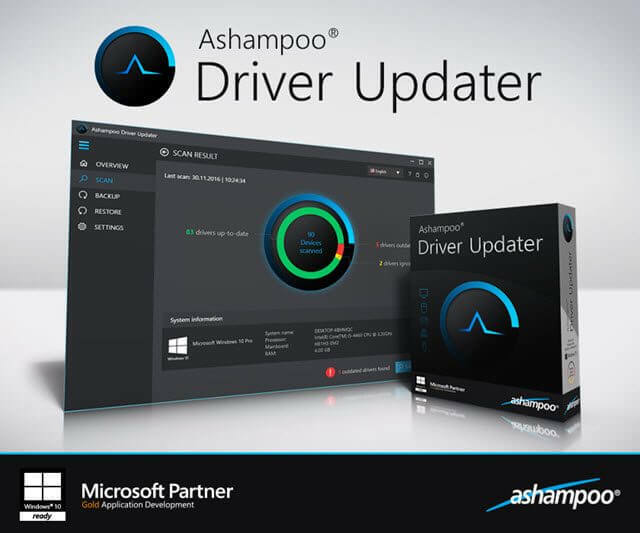 Enter to Win "Ashampoo Driver Updater"
Share on Twitter and Facebook for Bonus entries! It is a wonderful program. Thanks for the giveaway contest. Being 83 years old & on a fixed income , I have to relie on public domain for most programs I use. Dave’s Computer Tips has been a blessing. Thanks much. Old Hank. I rarely look for driver updates unless I have a problem, but I would use this if I win it because it is so easy, backs up drivers, and creates a system restore. I’ll bet that I need some drivers such as the SATA controller, and more. Thanks, Richard. Thank you for the opportunity to win this program. Great application! Thanks for the Giveaway!